A fever is the most common concern prompting parents to bring their child to the emergency department or urgent care. A fever itself is not life-threatening, unless it is extremely and persistently high. In most cases, there is nothing to worry about, as a fever is usually a normal response of a child’s immune system to a virus or bacterial infection. Most healthy children can tolerate a fever well. Some common reasons that children get a fever include bacterial infections, viral infections, side effects of medications, use of illicit drugs, and illnesses related to heat exposure and allergies. Additional reasons for a fever are the body’s response to immunization or vaccines, ear infections, urinary tract infections and certain inflammatory diseases. A sudden change in the weather and an unhygienic lifestyle may also contribute to a fever. Children can suffer from a low-grade or high-grade fever. In the case of a low-grade fever, the body temperature is slightly elevated above normal. This is generally between 98.8°F (37.1°C) and 100.6°F (38.1°C). On the other hand, a high-grade fever in children over 3 months old is a rectal temperature of 102°F (38.9°C) or higher. The general symptoms associated with a fever in children include chills, aches, headaches, sweating or feeling flushed, loss of appetite, dehydration, weakness or lack of energy, and generally feeling ill. Also, small children may become irritable, fussy, lethargic and cry more often. Although fevers aren’t usually a cause for serious concern, seeing your child suffer can be heartbreaking. But when children have a fever, they don’t always need to be given medication to lower it. To help your child be more comfortable and help ease the symptoms, you can use some home remedies. These natural remedies can support the immune system and increase your child’s comfort level until they are well again. You must take your child to the doctor or emergency room quickly if they have a very high fever of 104°F (over 40°C) or more and have symptoms like shivering or shaking uncontrollably, chattering teeth, trouble breathing, getting confused, or seeming floppy or complaining of leg pain. Also, call the doctor right away if your child is younger than 3 months old and has a fever. Here are the home remedies for a fever in children. For reducing body temperature, cooling the body from the outside is very effective. When your child develops a fever, the first thing to do is put a cool, wet washcloth on their forehead. As the water from the wet washcloth evaporates from the skin, it will draw the fever out and the temperature will come down quickly. Put some cool tap water in a bowl. 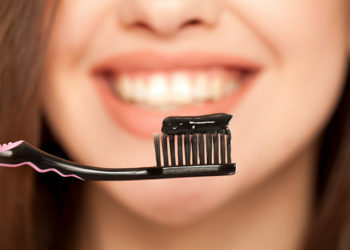 Optionally, you can add a few tablespoons of vinegar in it. The acid present in it helps draw heat out of the skin. Soak a clean washcloth in the water and wring out the excess water. Place the wet cloth on your child’s forehead. Do this until the fever has reduced sufficiently. Note: Do not use very cold water, as it may cause the internal body temperature to rise. 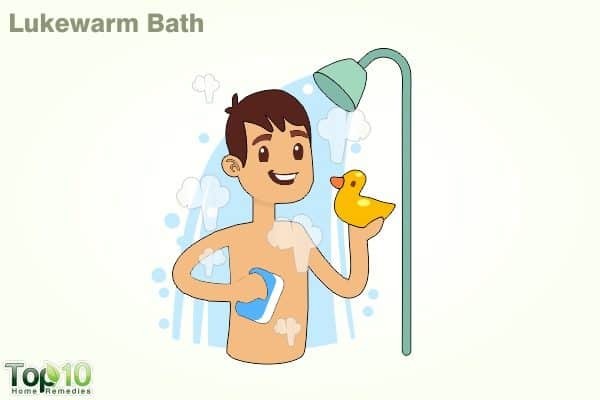 When your child develops a fever, you can give them a lukewarm bath. A lukewarm bath will help regulate the body temperature. It will also help your child relax and sleep better, which is needed for faster recovery. However, avoid a cold bath, as it can shock the body into trying to raise the internal thermostat even more. A 2018 study published in the International Journal of Applied Research reports that immersing the body or part of the body in a water bath stimulates circulation and reduces body temperature. You can give your child a lukewarm tub bath or sponge bath, depending upon which is more comfortable for your child. It can be done 2 or 3 times a day. Another option is to add a few tablespoons of vinegar to a bowl of warm water, soak a washcloth in it, wring it and use it as a compress on your child’s forehead. A 2015 study published in International Journal of Science and Research found that warm vinegar compress helped decrease body temperature in children with fever within 15 minutes. 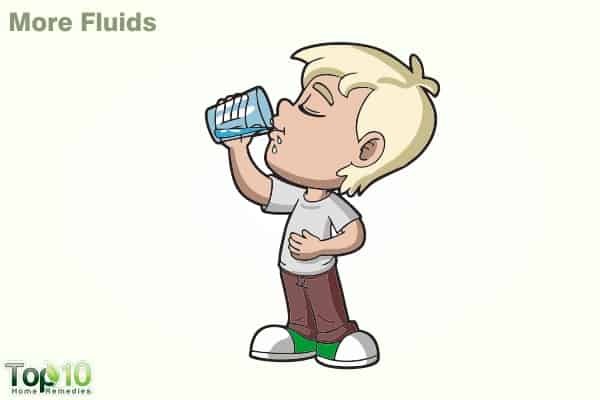 For children suffering from a fever, it is important to increase their fluid intake. Fluids will help cool them down and replace the fluid lost through sweating. This will also prevent dehydration, which may lead to various other complications and delay recovery. 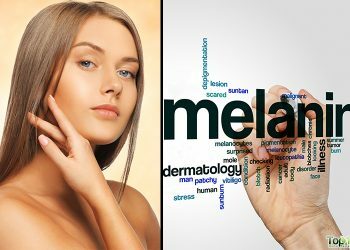 This remedy can be helpful even for dengue fever. A 2017 study published in PLOS ONE reports that improved oral fluid intake in patients with suspected dengue fever reduced hospitalization and intravenous fluid requirements. 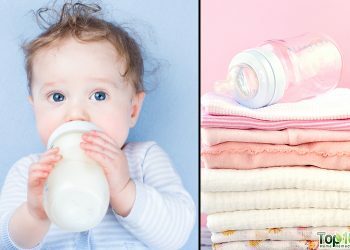 Give your child an oral rehydration solution (either homemade or readily available in the market) along with lukewarm water from time to time. Cold milk, coconut water, homemade fruit juice, fruits rich in water, broth, ice pops and yogurt can also be given to children. Because of the fever and associated discomfort, children may refuse large amounts of fluid at a time. So, give them smaller amounts more often. 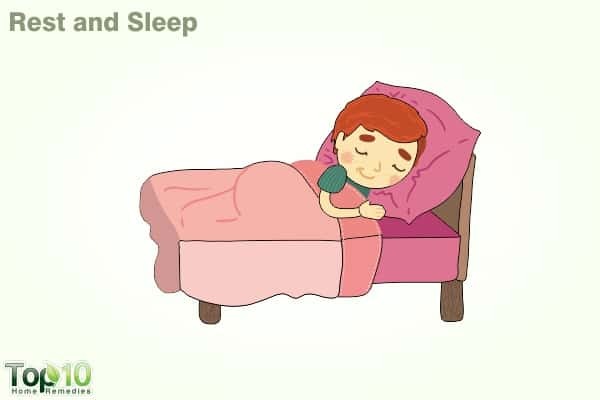 Irrespective of whether a child or an adult is suffering from a fever, adequate rest and sleep is a must. When your child rests, the body can dedicate energy to healing rather than distributing it to deal with other activities. Also, by sleeping the body will have the energy and time it needs to fight the incoming germs. So, it becomes important to make your child rest or sleep as much as possible. If the child is reluctant to sleep or cannot sit in one place for a long time, pick activities that can restrict movement like coloring, solving puzzles or playing with a favorite toy. You can also switch on the television and play your child’s favorite movie or videos. When your child has a fever, you need to keep them in a cool place. The temperature of the room should not be too hot or too cold. 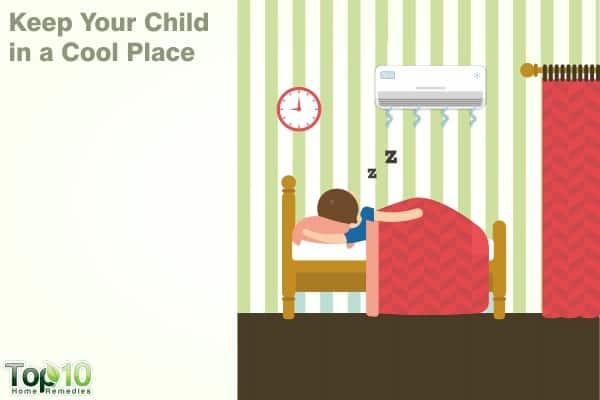 Try to keep your child’s room at a comfortable temperature between 70° and 74°F degrees (21.1° to 23.3°C). If using a fan, keep it on a low setting. However, make sure your child is not sleeping directly under the fan. If using an air conditioner, keep the temperature at a comfortable level. Make sure your child is not shivering, as this can raise the body’s temperature. Also, avoid using the room heater nonstop, as it can make your baby overheated. At the same time, dress your child in light clothing and have them sleep with only a sheet or light blanket. Bundling up your sick child with layers of clothes or extra blankets will keep the temperature from going down or even make it go higher. Basil is an effective herb for bringing down a fever in children. It has antibiotic and antibacterial properties that can help get rid of the bacteria that may be causing the fever. Moreover, it boosts the immune system, which is important for the healing process. Put a handful of basil leaves in 2 cups of water. Boil it until the solution is reduced to half. Add a little honey and give it to your child, a few times a day. 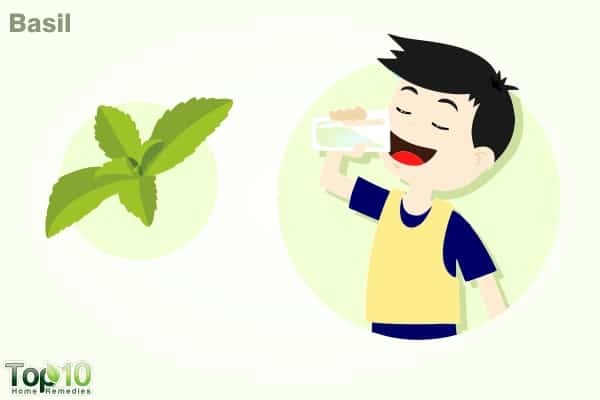 You can also give your child some thoroughly washed basil leaves to chew at regular intervals. Another option is to extract the juice from 5 to 7 basil leaves, then add a pinch of freshly ground black pepper and give it to your child 2 or 3 times a day until the fever is gone. A good way to treat a low fever is to use ginger. 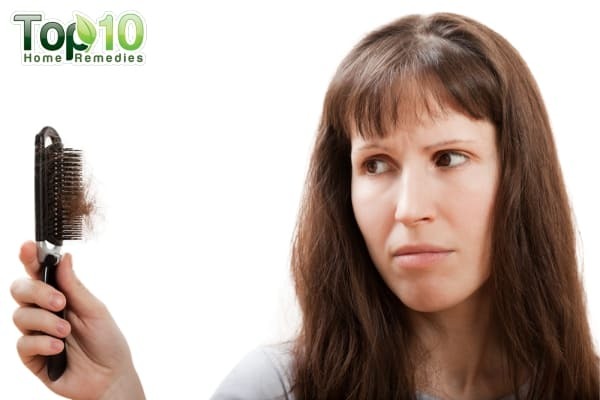 Ginger helps the body expel heat, which in turn helps reduce a fever. Its antibacterial and antiviral properties make it effective against any kind of infection. Plus, it boosts the immune system that aids in the recovery process. 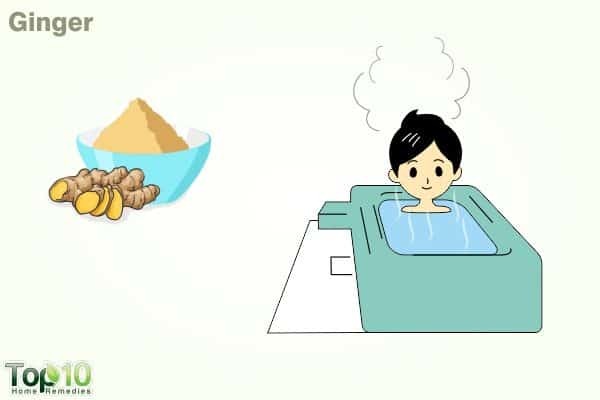 Mix 2 tablespoons of ginger powder into a bathtub filled with warm water. Soak your child in this bathwater for 10 minutes. Pat dry and cover your child completely with a blanket. Soon, your child will start sweating and the fever will come down. Another option is to mix together ½ teaspoon of ginger juice, 1 teaspoon of lemon juice and 1 tablespoon of honey. Give this to your child 2 or 3 times daily until the fever is gone. Feeding your child high-nutrition foods is a must to help them recover from the illness. 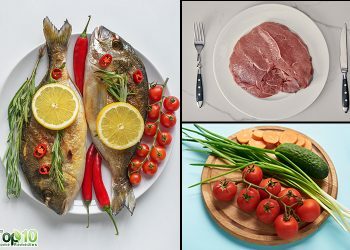 As the body becomes weak from the fever, it is important to follow a special diet to provide proper nutrition. A good diet will also help balance the body’s fluids and electrolytes, and boost the immune system. The diet recommended for your child is a high-calorie, high-protein, low-fat and high-fluid diet. Bone broth or chicken soup with vegetables is ideally the best options for your child. Bone broth has a high content of cartilage, which helps in the generation of white blood cells that defend the body against infections. Also, bone broth is easily digestible. Vegetarians can go for carrot soup and other healthy vegetable soups and broths. High-carbohydrate foods must also be included in your child’s diet to meet the body’s energy requirements. Spicy, fatty and high-fiber foods need to be avoided, as they are difficult to digest. Due to a loss of appetite, do not expect your child to eat a good amount. 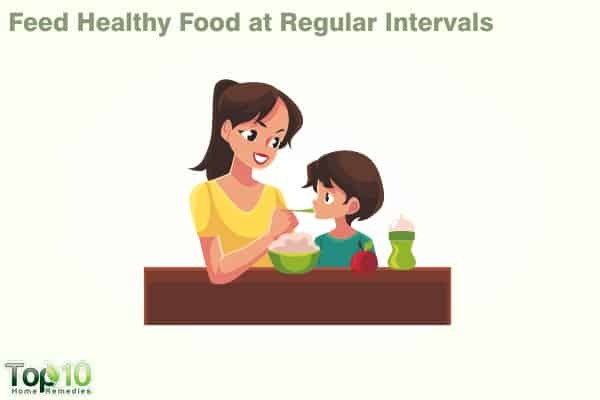 Feed your child every two hours initially and as they feel better, you may reduce the frequency to once every four hours. Doctors may prescribe antibiotics if your child has a bacterial infection that’s causing the fever. Antibiotics can’t be used to treat viral infections. Make sure your child does not participate in any strenuous activities, as that could elevate the body temperature. Small children should never be given aspirin for an illness. It may increase the risk of a rare, but fatal, condition called Reye’s syndrome. Do not expose your child to direct sunlight while they have a fever. Avoid excessive exposure to public places, as a weak body is vulnerable to infections. Smoking suppresses the body’s immune system, so make sure that your child is not exposed to passive smoking from cigarettes or any other tobacco products. Fever in children: How can you reduce a fever? PubMed Health. https://www.ncbi.nlm.nih.gov/pubmedhealth/PMH0072637. Published November 17, 2016. Effectiveness of hot water foot bath therapy in reduction of temperature among children (6-12 years) with fever in selected hospitals at Mangaluru. International Journal of Applied Research. http://www.allresearchjournal.com/archives/2018/vol4issue1/PartB/3-12-96-324.pdf. 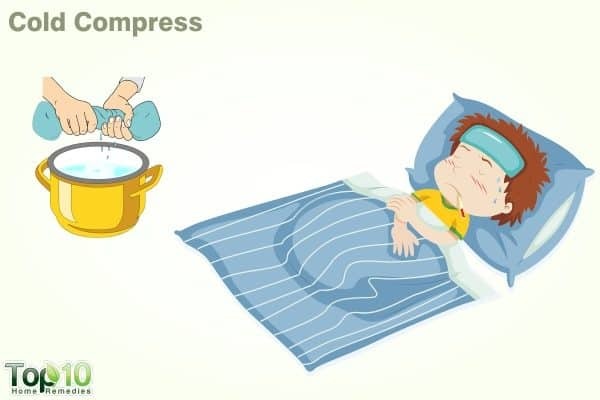 The Effectiveness of Warm Vinegar Compress in Lowering Children Body Temperature with Acute Febrile Illness. International Journal of Nursing Science. https://www.ijsr.net/archive/v6i1/ART20164539.pdf. Effectiveness of a fluid chart in outpatient management of suspected dengue fever: A pilot study. PLoS One. https://www.ncbi.nlm.nih.gov/pubmed/28977019. Published October 04, 2017. Tulsi – Ocimum sanctum: A herb for all reasons. Journal of Ayurveda and Integrative Medicine. https://www.ncbi.nlm.nih.gov/pmc/articles/PMC4296439. Published 2014. Complementary Treatment of the Common Cold and Flu with Medicinal Plants – Results from Two Samples of Pharmacy Customers in Estonia. PLoS One. https://www.ncbi.nlm.nih.gov/pmc/articles/PMC3590151. Published 2013.
lately I have not received any letters from you to my address. Thank you. i have learn a lot from your few lines…..